During cold times of the year blooms can be few and far between. Luckily we have orchids indoors to hold us over until the first flowers of spring emerge. The home environment is perfect for orchids, and with little care they are able to thrive. 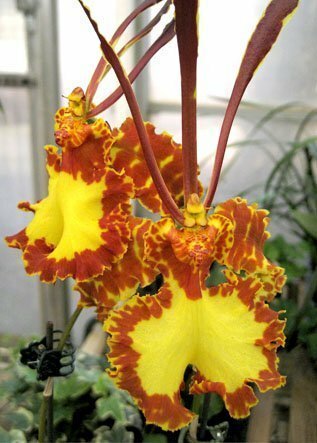 One of the most intriguing orchids, the psychopsis or butterfly orchid, is characterized by its striking bloom that closely resembles a brilliant butterfly’s wings. 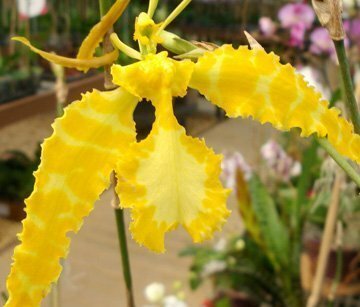 Though this orchid is often classified as a type of oncidium called a papilio, it has been up for debate recently. Many have begun to argue that the oncidium alliance is simply used when classifying orchids that do not fit into one clear category. The butterfly orchid will continuously bloom throughout the year on a stem that can reach up to three feet tall. Native to Central America, this orchid has proven itself a winner not only in its beautiful bloom but also attractive foliage. In nature the butterfly orchid grows on the trunks and branches of trees making it an epiphyte orchid. Its large yellow, orange, and brown flowers, with almost antenna like petals, give it the appearance of a butterfly. It’s one of the most intricate and interesting of orchid blooms. The orchid mania of the 19th century is believed to have started with the butterfly orchid. In 1883, George Spencer Cavendish, the 6th Duke of Devonshire and future president of the Royal Horticultural Society, discovered this orchid in full bloom and was so memorized by its beauty that he decided to dedicate himself to orchids. The care of this orchid is similar to the better-known phalaenopsis, or moth orchid. It likes bright, indirect light and well-drained, coarse potting medium. A stem will begin to grow once the plant is large enough. If your orchid fails to bloom, move it to where it receives more light. Once in bloom the same stem will continuously flower for years, so do not cut it until it dries up and becomes brown. The butterfly orchid prefers watering twice a week, but be sure to allow the plant to dry out in between waterings to prevent rot. The more light it receives, the more water it will need. Be careful not to over water this orchid, as it can be susceptible to rot. Use a diluted fertilizer specifically created for orchids every other watering. Like most orchids, it does not need to be repotted very often since it prefers to be snug in the container. Repotting once every two years is recommended. The butterfly orchid is a sure showstopper with its magnificent bloom and unique foliage. Its blooms are continuous and each bloom lasts about a month before falling off. Once the old bloom falls off a new one develops directly and immediately behind it. No need to wait a whole year for this orchid to bloom again. This is truly a unique orchid with a special place in any home. Christian Sloan is an orchid enthusiast and collector. You can find her most days at Atlantic Avenue Orchid & Garden in Raleigh where she works as greenhouse manager.